Effective communications throughout the corporate offices are an important part of daily operations. Employees, customers and vendors all need information about your business and the industry but it can be difficult to relay the proper messages to these different audiences. Corporate communications through digital signage resolves these challenges. Digital corporate communications from the lobby to the hallways and break rooms are effective methods of sharing general information as well as urgent corporate news. Corporate news, greetings and event information is shared in the Lobby. Internal general non confidential content is displayed in the Hallways. 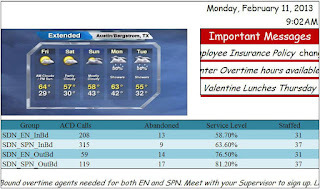 Break Rooms can be used for product news, call center agent status, advertisements, messages, alerts, news and weather. Cafeteria / lunch rooms use corporate communications in a multitude of functions. News, weather, sports, event information, CEO webcasts, call center agent status, visitor greetings, vendor advertisement, stock prices, RSS feeds, menu’s, employee photos, and so much more! Rooms and areas used by senior management utilize corporate communications to stay alert on messages, RSS feeds, news, stock information, competition, industry and market trends, etc. Welcome customers to your business with an appropriate and inspiring message. 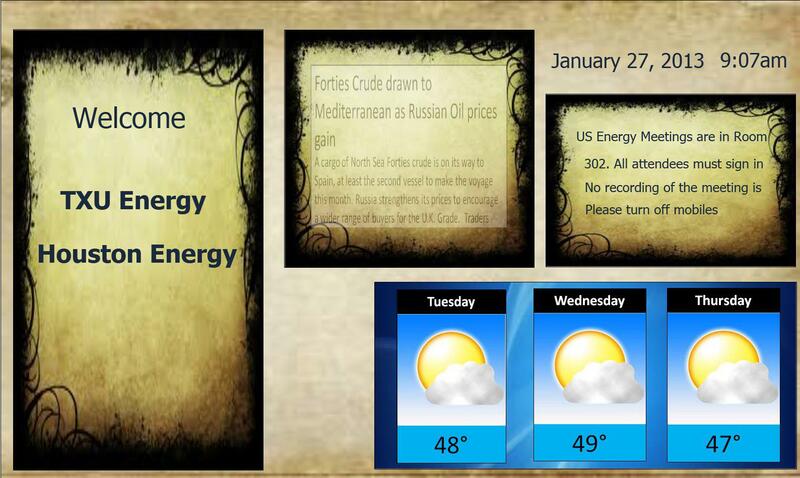 Share your business information with the customer as well as local news and weather. Industry news can be worthwhile information for the lobby audience as they wait for their meeting with you to begin. Too often we miss the opportunity to give information about our organizations to our customers or vendors. You can provide industry news, event information and invites, and you can tailor the lobby content so it meets your needs and requirements. Certain information can be denied access to the lobby so confidential customer or business news is not provided to the wrong group. Employees are overloaded with email, text message and corporate documents that have vital information for the employee and business. Too often this information is not read by many within the business and they miss out on opportunities to learn. Sharing this information or alerting employees about information is a critical way to improve employee knowledge. 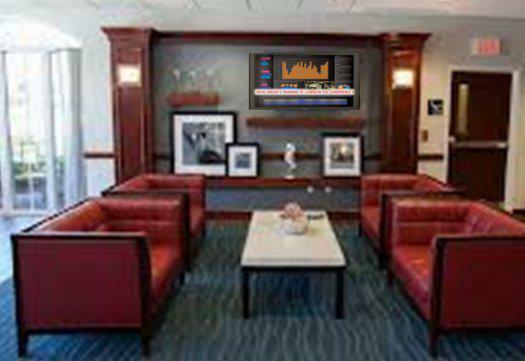 Content on the screens in the hallway can and should vary based upon the audience that shares that hallway. Industry news, contact center status information, business performance information, private company events, public company events, advertising, etc. Share content that meets the level of the audience. 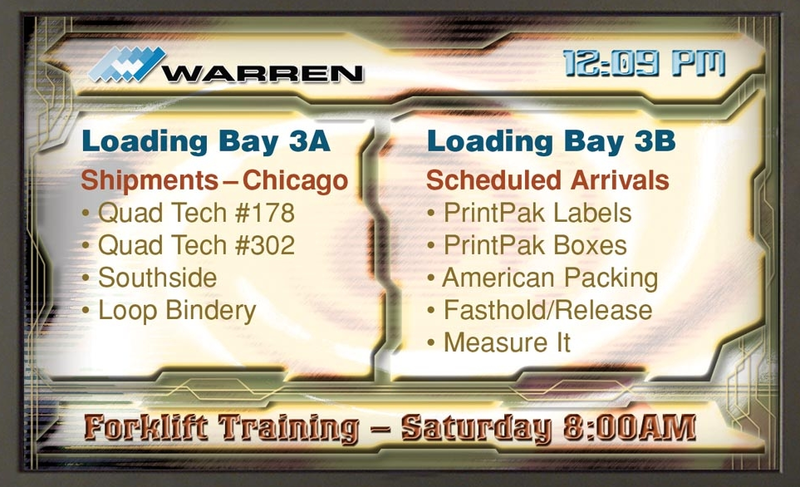 Again the audience that will see the content on an LCD Screen in the break room will determine what information is provided. A private, company only, break room can share vital business information such as business status, call center agent status, revenue information, customer details, business / industry alerts, customer service ticket status, etc. Many companies have high employee sick days the day of or after a major sporting event such as the Super Bowl or the World Cup. By adding the sporting event to the LCD screens in the office employee sick days can be reduced. Within a Call Center the Manager had the World Cup running on the LCD screen. 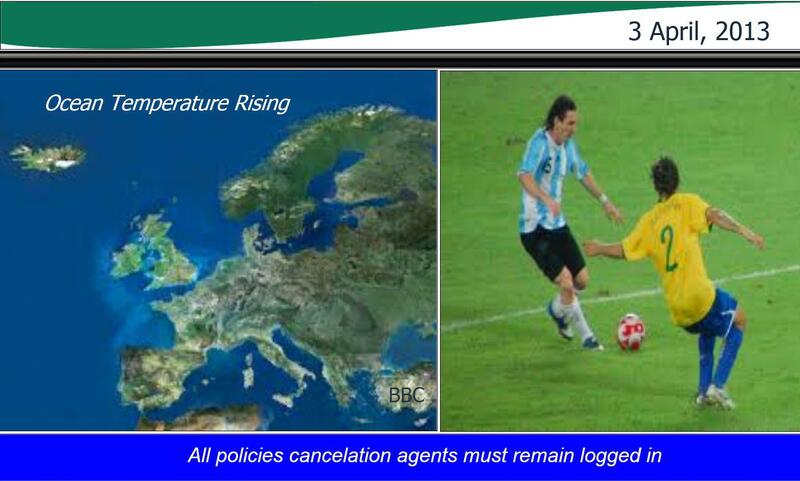 If the Service Level for the call center dropped below 60% the World Cup would no longer be running on the LCD Screen. 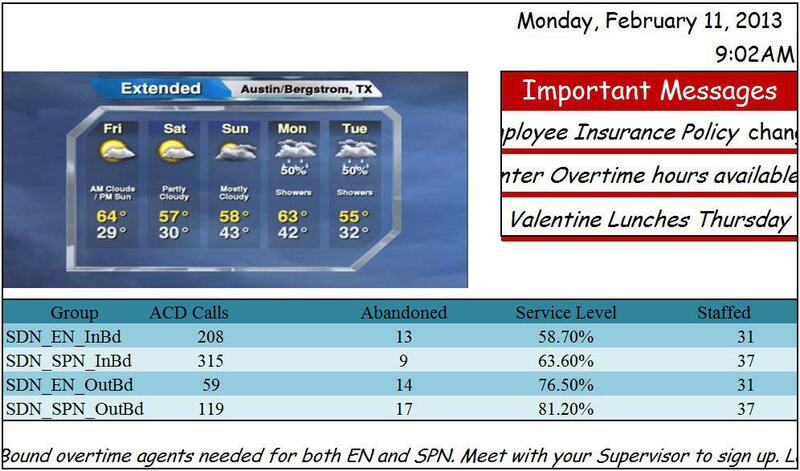 This manager was able to have employees show up for work, improve customer support and have increase overall morale within the call center. We usually think of digital signs in the cafeteria as a menu board or a TV. 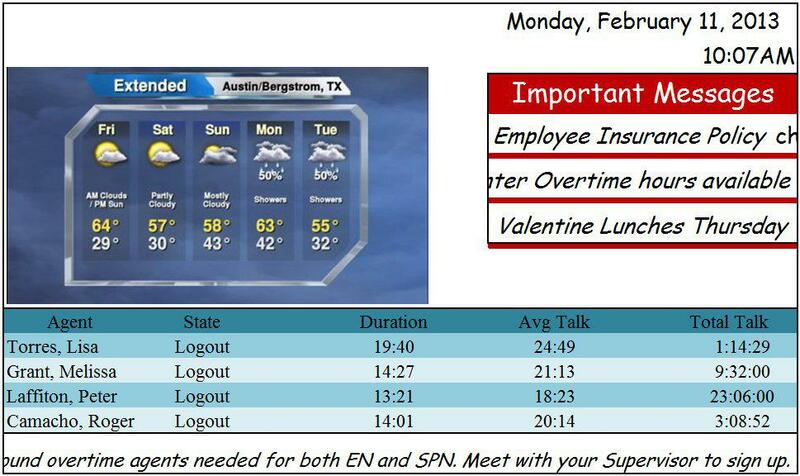 Corporate communications is showing up much more often on the LCD Screen showing a variety of content. 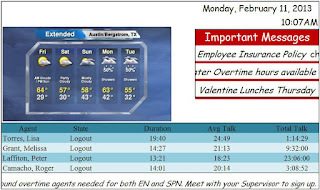 Certainly menus and employee’s of the week are up on the screen, but other content is shown and requested to be shown as well. Greeting visitors, alerts, building changes, important dates, vendor advertizing, traffic alerts, news, industry information, company events, photos from an event, call center status for critical agents, CEO video, RSS feed, stock prices, etc. 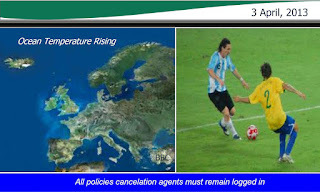 These two images show the agent status and the Group status for the day. Agent Status so the agents make it back to their desks on time. The location of the LCD screen will assist in the value of the screen. Having the screen near the lines in the cafeteria will help get the content across to the audience. Cafeterias vary and there are other locations for the screens. Exits, tray return, coffee machines, and other locations that are used outside of the normal lunch hour are good places for the LCD screen. Companies are expanding their communications by displaying relevant and important information to employees, vendors, customers and senior level management. The content can vary based on the location of the LCD screens, who sees the screens, and the content that is available. There are many options regarding content. Internal company data that shares the stability and growth of the organization improves employee morale. Industry content shows vendors and employees what is occurring in the marketplace. Local information for customers and employees reduces the boredom at appropriate times. The idea behind sharing information is to improve relationships between the company and all those that see the information.